MASTER PROBLEMS People and Society Why environmental pollution is a deep rooted problem? Why environmental pollution is a deep rooted problem? All the gloomy predictions, the dire warnings and bitter complaints about the ruining of the environment will not change matters. Only getting at the true cause and remedying it will bring relief. How and when did the problem get started? Why has it been allowed to reach such disastrous proportions? These are the apparent, visible causes. But beneath them is a more basic cause. Let us see what has happened and how deep-rooted the problem really is. 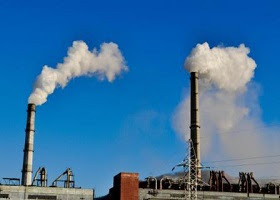 Most researchers relate the growth of pollution to the so-called Industrial Revolution. It began over two hundred years ago, in the middle of the eighteenth century. Till then four out of five men were farmers. Farming families grew their own food, spun their own cloth, often made their own furniture and even many of their tools. Towns and villages were their market centers. There craftsmen lived and worked in their homes or in small shops, turning out metalwork (hardware), perhaps printing books and papers, producing jewelry, silverware, and better quality products of cloth, leather and wood than those the average farmer might make. With such products they could buy food from the farmers, or a merchant might buy their products and ship them abroad, obtaining in exchange foreign products viewed as luxuries. Two factors in particular changed the structure of human society in many lands: capital and scientific invention (technology). But a third force spurred these factors to unite. At first it may have been relatively simple things, men desiring the tools that the newly invented machines could produce, women wanting machine-woven cloth. But as the flow of products grew, their desires grew with them. The machines—spinning machines, weaving machines, steam engines, iron-producing furnaces, converters and rollers—were expensive. Only those few men with capital could buy them. Then they had to establish factories, preparing special buildings for their machines, hiring persons to be trained and employed at operating them. Investments were heavy and the investors were, of course, determined to realize good profits. As industries spread, men were drawn from farms, from private crafts in shops and homes and became factory workers. And factories tended to group together in cities where fuel and labor were cheap. The basic outlines of the pattern of pollution now become visible. Time brought faster, more complex, more automatic machines that made earlier ones seem primitive. But they also required more power, larger quantities of fuel. More and more products that had been handcrafted were added to the list of machine products. Individual artisans steadily diminished in numbers. Smaller shops and industries had to keep up with the march of technology or be ruined by competitors with faster mass production. The invention of the steam locomotive and, later, the internal-combustion engine using gasoline added to the growth of industry. With faster and cheaper transportation, factories could expand their markets, send their products farther and farther afield, as well as bring raw materials and fuel from more distant points. Eventually huge industries developed, smaller ones often being squeezed out or absorbed. But such progress carried a very high price. It seriously affected the quality of human life. In the mushrooming industrial towns, factories often settled on choice locations, as by a stream or waterfront. Their waste products were flushed into the streams or dumped nearby. Mines producing the vital metal ore and coal gouged deeper and deeper holes in the earth or, by “strip-mining,” leveled hills and scooped out large craters, leaving behind devastated areas that covered many square miles. Oil wells were later to have an even greater share in the polluting process. Train lines scarred hillsides and locomotives puffed into the very heart of the cities, bringing smoke, grit and noise. People then generally found all these things initially exciting. Even when they ceased to be so, the people had by then become accustomed, conditioned, to them. The development of the use of fossil fuels—coal and, later, petroleum products (gasoline and kerosine)—played a major part in industrial progress. These fossil fuels were more easily transported, had greater power potential than earlier fuels (wood and vegetable oils). But, since they did not burn as completely, they released into the atmosphere greater concentrations of various gases—carbon monoxide, sulfur oxides, hydrocarbons, nitrogen oxides—as well as some solid particles. Belching forth from a few smokestacks or from home chimneys, they produced no notable damage. Only when their number multiplied many times over did the real danger begin to make itself clearly felt. Today, in major cities around the world the eyes of millions of persons smart, their lungs are irritated and cases of emphysema, bronchitis and lung cancer are on the increase. They may not suddenly die. But their life-span is certainly being shortened. To all this must be added the extension of scientific technology into two other fields: agriculture and war. Farms, faced with dwindling manpower, have become mechanized and have used chemical fertilizers and pesticides. This has made crop yields high. But pollution has been just as high. The scientific development of war equipment, particularly that of nuclear bombs, has introduced the new danger of radioactive pollutants. It took thousands of years for earth’s population to reach one billion (one thousand million) in 1850. By 1930 it reached two billion and today it stands at 7.4 billion. This “population explosion” has aided the Industrial Revolution in its striving for ever greater production, more gigantic operations. With more people, the demand for more power—in industries, homes and transportation—has grown. Burgeoning cities steadily took over more and more of the surrounding farmland. And the land bordering the new limits frequently suffered, either due to pollution or due to being farmed till it lost its fertility. Food had to be trucked in from greater and greater distances. Suburbs developed as people sought relief from city deterioration. But this eventually added to pollution by increased use of private motorcars. Vast networks of highways developed, steadily spreading more and wider strips of concrete or asphalt over what was once green countryside. Large-scale industry needs a constant market for its products. During the early stages of the Industrial Revolution depressions were frequent, for the new mass-production machines often caused supply to outpace demand. The big factories were not flexible and able to adjust to current demand like the earlier private craftsmen, who often knew two or three trades and even did occasional agricultural work. The “population explosion” only partially offset this problem. So, manufacturers have sought to stimulate and foster demand. Advertising, also the periodic production of new styles or minor improvements that made older models seem less desirable, encouraged buying. The aim was not to supply what people needed as much as what they could be made to want. Things were often designed to have a limited lifetime, thereby bringing more consistent demand over the years. Due to this “planned obsolescence,” cheapness was often rated more important than quality and durability. All of this has produced what is often called a “throw-away” society, one that uses products for a while and then discards them. To change this wastefulness would drastically affect the economy of many nations. You can see, then, how an extremely complex, deeply rooted, problem has built up. It has come gradually, spread out over the life of many generations.